With so many beautiful spring nail polishes out, I'm definitely enjoying changing up my nails more often. Lately I've been really loving Revlon "Flirt". It reminds me of a cross between a bubble gum pink and a soft light lavender. This color has been on my nails since Sunday night, and only today has started chipping! I've also been layering it with the Revlon Quick Dry Top Coat - which I loveee! I've tried many top coats in the past (OPI, Orly, Sally Hansen) but will definitely repurchase! What other colors scream spring/summer to you? 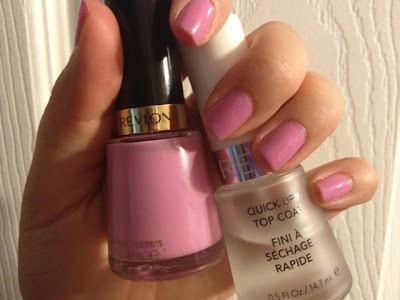 I find Revlon polishes last quite a while on me as well! I never think to pick any up though - this one is VERY pretty though! Hi Annick:) I agree, I've just started buying Revlon polishes (they always seem to be on sale and have coupons available!). Hi Chelsea! I'm falling in love Revlon polishes lately. I agree the color selection is great and I'm happy with the quality too! thanks does following too!